Sugarless gummy bears are not an age-specific treat. While this colorful candy can quickly bring a smile to a child’s face, sugarless gummy bears can also be a pleasurable, guilt-free indulgence for adults who are dieting. Worldwide distribution of gummy candy began in the 1980s and became a phenomenal hit with kids. Parents know they’ve hit upon something wonderful when a bag of colorful bears can generate the level of excitement that gummy bears bring about. Parents also know how important it is to choose their children’s snacks wisely. Brightly colored sugarless gummy bears are a treat that parents can feel comfortable giving their kids. The popularity of many treats may reach a peak but often fail to endure for an extended period of time. The popularity of gummy candy seems to be timeless. Sugar free gummies have transitioned into the healthy eating trends that parents are trying to get their kids to adopt. Sugarless gummy bears are just as colorful, flavorful and delightfully soft as regular gummy bears. Kids are excited to find gummy candy in their lunch box or in the selection of treats at home. Some things don’t change as a child gets older. College kids can still experience that childhood delight when they receive a care package from home that contains gummy candy. Receiving gummies in a care package is probably not the only time they enjoy that treat. It’s highly likely that sugarless gummy candy can be found in the dorm room, apartment or backpack at almost any time. The pleasure of chewing on these fruit-flavored treats is not reserved for kids and teens. 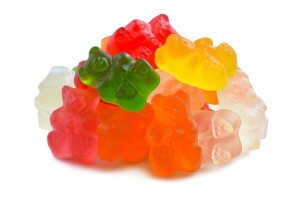 Diabetic or dieting adults can enjoy sugarless gummy bears as a dessert or snack. Packs of sugarless gummy bears or butterflies can easily be kept in a desk drawer at work or stashed in a purse or tote bag. They look festive and enticing in a glass jar on a desk or kitchen counter. Sugar free gummies are a treat that should be on your party table so that kids and adults on a sugar-free diet will have a fun, tasty treat to enjoy. Colorful sugarless gummy bears and butterflies can brighten up any party décor. Sugar free gummies are great for Halloween treats and holiday festivities. Almost any child or adult would be pleasantly surprised to find a bag of sugarless gummy candy in their birthday or holiday gift bag. Sugar-fee gummies are a fantastic summertime treat. Unlike some other sweet treats, gummies don’t melt quickly. They’re a great snack to take on a camping trip, bike ride, hiking adventure, road trip or day at the park. Stash some of these fruit-flavored treats in the freezer to make them an even more enjoyable treat on a hot day. It’s a good idea to keep sugar free gummy candy on hand at home, work or college. It’s a great pick-me-up treat on those difficult days when you need a lift. Sugar free gummies may be small but they can deliver a large amount of pleasure.